It is with great sadness that the family of the late Margaret B. Hackett (nee Benoit) announce her peaceful passing while surrounded by her loving family on Monday, January 14th, 2019 at the Corner Brook Long Term Care Centre at the age of 89. 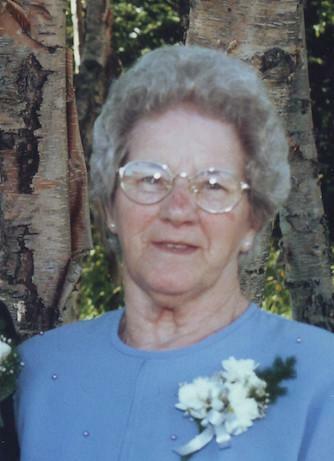 Margaret was born April 27th, 1929 on Woods Island, she was a loving wife to her husband Patrick John Hackett (Jack) of 64 years, who predeceased her on November 17, 2013. She will be lovingly remembered by her 5 sons: Patrick (Sandra), Leo, Charlie (Savi), Christopher (Lisa), Eugene (Tina) and 4 daughters: Caroline (Carrie) Power (Tom), Lillian Dawe (Guy), Bernadette Porter (Don), and Margie Penney (Dennis); 16 grandchildren: Norm Pennell (Tammy), Mark Hackett (Sherri), Rod Hackett (Judy), Dion Porter (Corina), Justin Porter (Stephanie), Stephen Power, Catherine Power, Matthew Dawe (Jenn), Christopher Dawe (Jessica), Sabrina Price (Steven), Jonathan Hackett, Ashley Hackett, Patrick and Trisha Hackett, Claire and Sara Penney; nine great-grandchildren; Sarah and Kaitlyn Pennell, Nathan and Cole Hackett, Hailey Hackett, Emma Porter and Naomi Porter, Avery Dawe and Kaiden Price; sister Rita O’Connell; sisters-in-law Rita Bennett, Genevieve Bennett and Isabel Compagnon; brother-in-law Joseph Bourgeois; as well as numerous nieces, nephews , other relatives and friends including staff and residents at Corner Brook Long Term Care. Predeceased by her husband Patrick John (Jack) Hackett; parents William and Mary (Gallant) Benoit; brothers Ben, Bill, Frank (Elsie and Marjorie), Nick (Margaret), Isaac (Mary), Pius (Alice) and Felix; sisters Mary Bourgeois and Della Connolly (Anthony); sisters-in-law Joan Holden (John) and Mildred Holden (Tony) and Father and Mother-in-law Charles and Agnes Hackett. Friends may visit Fillatre's Funeral Home, 218 Curling Street on Wednesday from 7-9:00 p.m. and Thursday from 2-4 & 7-9 p.m. The Mass of Christian Burial will be held on Friday, January 18th at 11:00 a.m. from Our Lady Star of the Sea Church in Benoits Cove, Father Jim Robertson officiating with cremation to follow. As expressions of sympathy flowers are gratefully accepted or memorial donations may be made to the Alzheimer's Society or to Our Lady Star of the Sea Parish. The family guest book may be signed by visiting our website www.fillatre.ca.